The JetiBox Profi is designed to be an easy to use mobile wireless device for viewing, processing and storing your telemetry data or for programming JetiBox compatible equipment. The JetiBox Profi also is designed to work in two different wireless modes with the Jeti Duplex 2.4GHz systems. In Monitor mode it can only receive its data by "listening" to the existing connection between a Duplex 2.4GHz equipped transmitter (or transmitter with Duplex module) and a Duplex receiver. In Telemetry mode it receives its data directly by "listening" to the existing Duplex 2.4GHz receiver and installed sensors or telemetry equipped ESCs like Jeti Mezon. JetiBox Profi can be used in Standalone Telemetry mode only with R4US, R5US, R6US, R7-9-11US, R14-18US Receivers running Version 3.11 of the Rx firmware. All of the telemetry screens have been updated to support the latest Duplex EX sensors. 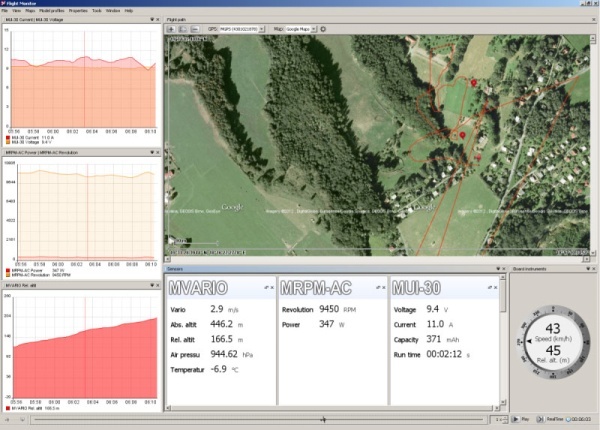 You can display up to 20 different telemetry parameters on 5 different desktop screens and also monitor the output of up to 16 transmitter channels. In addition to monitoring telemetry in real-time, you are able to record telemetry data for review after the flight. You can then view the logged data using the Jeti Graphics Flight Monitor Interface. Another cool set of function are the programmable alarms. This has proven to be a bulletproof way of enhancing safety for both yourself and your model. You can simply set a receiver battery capacity alarm for the desired capacity used and once that number is reached the system acoustically and visually gives you warnings. The JetiBox Profi can work as a parallel wireless monitoring device for your telemetry digital data stream with the Jeti DC/DS-16 2.4GHz Duplex radio system. This allows all of your telemetry data to be safely monitored by your co-pilot while you are flying your model. We think this is one of the best ways to both fly your model and safely monitor your telemetry data. All Duplex EX telemetry sensors can be directly plugged in or wirelessly connected to JetiBox Profi for programming and data viewing. Also, the entire line of Jeti SPIN and Mezon ESCs can be directly programmed using the JetiBox Profi. The JetiBox Profi is designed to be an easy to use mobile 2.4GHz wireless device for viewing, processing and storing your telemetry data and/or for programming your JetiBox compatible SPIN/Mezon ESCs and Telemetry Sensors. You can see battery capacity alarm activated. ProfiBox Profi will program all Jeti Duplex Sensors. You can see displayed actual Receiver Voltage and Variometer. Especially helpful for soaring sailplane models. You can see displayed Battery Capacity (mAh), Battery Voltage (V), Current (A) and Motor Run Time. You can see displayed GPS Coordinates, GPS Satellite Count and Local Time Stamp. You can see displayed actual Receiver Voltage, Receiver Antenna Signal Strength and Temperature in Celsius or Fahrenheit. Any Jeti Duplex 2.4GHz receiver can be used with JetiBox Profi for standalone Telemetry.